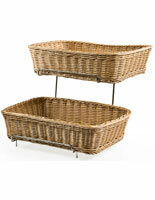 Includes two open shelf trays for displaying a variety of items. Black powder coated finish complements any retail setting. Durable wire construction designed to withstand any busy environment. 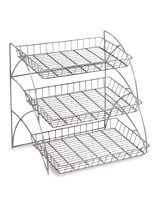 This wire metal rack is designed specifically for use on a counter or tabletop area. 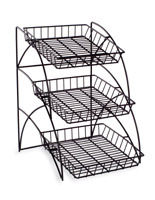 This tiered display is fabricated from durable wire with a powder coated black finish. 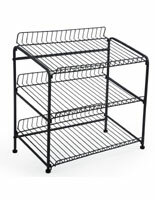 A storage stand, wire metal rack is versatile and functional for use in any retail environment. The design of this countertop display allows a large quantity of items to be offered without consuming a lot of valuable merchandising space. 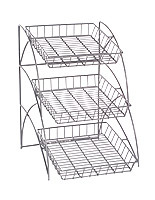 Create a successful point of purchase presentation with this wire metal rack. Most any type of small products can be placed in these trays. 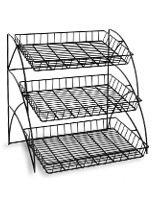 A wire metal rack is commonly seen in supermarkets, convenience stores, pharmacies, bakeries, restaurants and cafeterias. Use this metal rack to display food packages or snack bars on the tray and place it near the check-out areas to catch buyers' attention. This countertop display, wire metal rack will keep your merchandise neatly organized, while remaining highly visible to the public. Made with an angled back design, this tiered display allows customers to easily view all the products on the shelf. 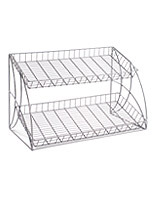 We include this wire metal rack with 2 trays for you to display any small items and save space for other displays. For places with limited space, this wire display metal rack is definitely an ideal and affordable display solution for you! 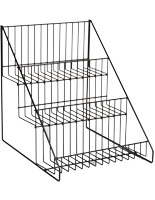 Use this wire metal rack to display small items that will entice impulse buyers at the register counter. Place pre-packaged items such as gum, candy bars or small toiletries on this display stand. 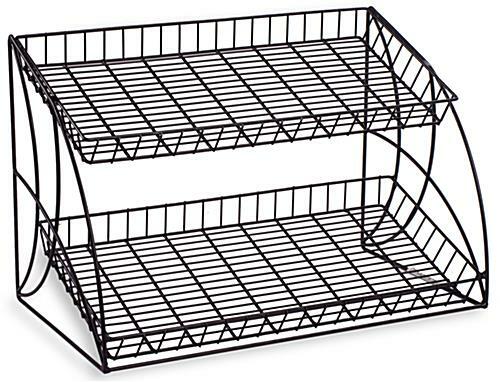 This wire metal rack, such as a counter display or storage rack provides a stunning display that will complement any décor. 25.8" x 18.0" x 16.5"
We'll use this tabletop rack at artisans markets to display jewelry in 6 x 4" boxes. We can fit 4 boxes long and 3 boxes wide, so 12 boxes on the lower shelf and 12 at the top. It looks absolutely perfect for our display and I'm thinking of getting a second one. We'll add a sign that clips on the rack. Nice quality product. Exactly as described. Will purchase from this supplier again. This was the first time I have ordered from this company and I was a bit skeptical. However, I was pleasantly surprised with how fast I received the order, the packaging and the quality of the display. It is much sturdier and more professional than I thought I was going to get at this price point. Needless to say, I will definitely be ordering from this company again! Thank you for the review, Melanie. If you are planning on ordering from us again, feel free to like us on Facebook; we offer various social media-exclusive discounts and deals that you may be interested in for future orders! These fixtures fixed our product presentation at our summer events. This rack shows off our product and is very capable of holding a lot of product. Thank you for the feedback, Janet! We produce popcorn and kettle corn in our commercial kitchen at our farm for direct retailing to farmer market customers. The wire racks are placed on Expresso colored table linen covered standard plastic folding tables set up under ten foot square Pop-Up market tents, The two tiered racks filled with heat sealed popcorn bags look terrific. The racks are rugged yet lite in weight for easy handling and are so harmonious in appearance with farmers market settings . Many market vendors could benefit by using these racks to display their products. Displays2GO promptly shipped the order to me! I hope 2GO will carry this line of racks far into the future.